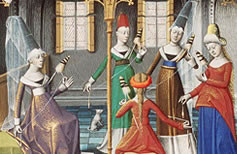 Throughout the entire Middle Ages clothes mostly remained unchanged, and novelties were introduced gradually. By the arrival of the Germanic tribes to European territory, trousers became more common, and an omnipresent element in both female and male clothing throughout the entire period were tunics. Social classes, professions and nations differentiated by clothes, and by the end of this period it assumed somewhat more extravagant shapes, which outraged the ecclesiastical community. By leading an active foreign policy, Zvonimir maintained the power of the Kingdom at the same level as did his predecessor, and throughout his reign Croatia continued facing feudal system that was infiltrating from the west of Europe. Zvonimir's son Radovan died before his father, thus after king Zvonimir's mystical death, he is succeeded by the last descendant of the Trpimirović dynasty, Stephen II, who will rule for only two years. Read more on this topic in the last article of the series "Trpimirović, a dinasty of Croatian rulers". During Krešimir's reign, Zvonimir, who was ban at the time, successfully ended a conflict with the Istrian margrave Ulrich I Weimar Orlamünde, and by doing so obtruded himself as Krešimir's heir. 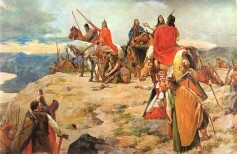 In 1075 Zvonimir was crowned in Solin a king of Croatia and Dalmatia. With this act, he became a papal vassal. In return, pope Gregory VII helped Zvonimir by providing him protection against Vecelin, a knight that invaded the Kingdom of Dalmatia. Zvonimir is mentioned as a Croatian king in Baška tablet, an old Croatian monument from 1100 written in Glagolitsa. His capital was Knin, and his main objective was to rely on the Church, thus to give up the old dynastic tradition. After his ascension to the throne, Peter Krešimir IV was faced with the ongoing schism. The church council held in 1060 was aimed to preserve the unity of Christian West, since Dalmatian cities were politically and traditionally tied to Byzantium. Shortly before the crisis that distressed the Empire, Dalmatia found itself under the jurisdiction of Croatian king. Krešimir's residence was Biograd, and his active external and internal politics resulted in the spreading of Croatian borders further than any ruler before him.